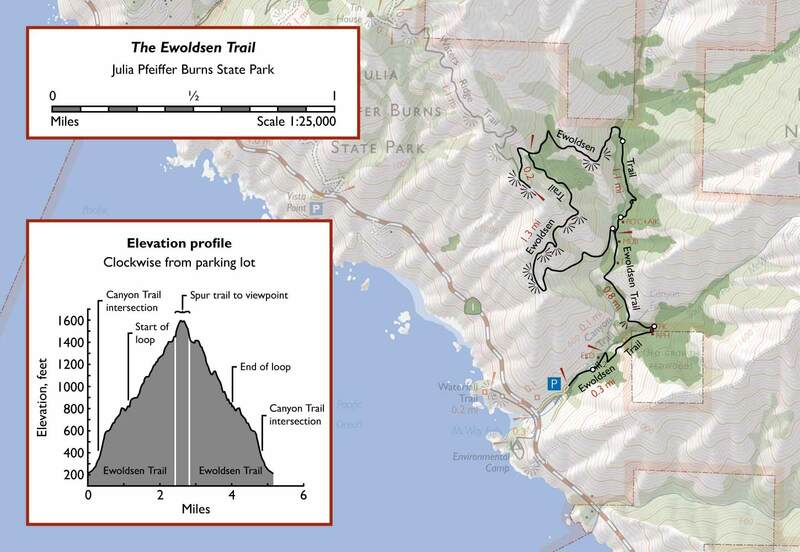 Like most state park trails in Big Sur, the Ewoldsen Trail is closed. It was closed after a major wildfire in 2008, reopened in 2014, and closed again after another wildfire in 2016. 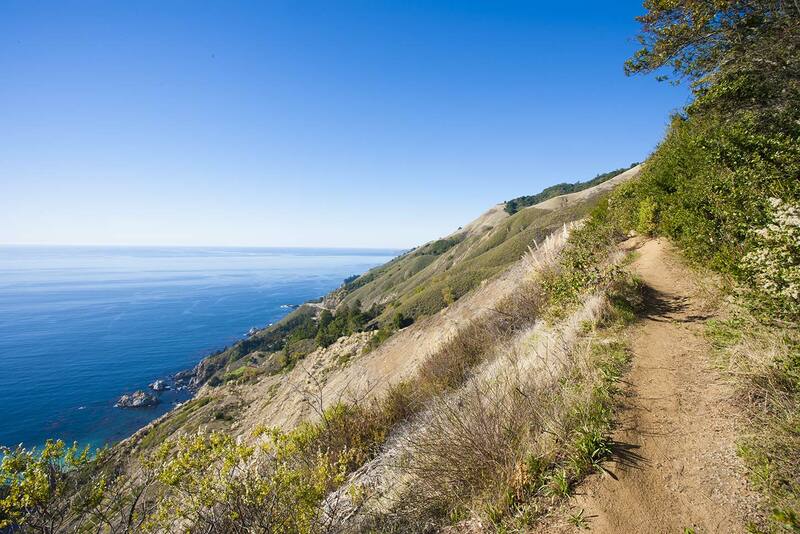 The Ewoldsen Trail is the quintessential Big Sur hike. In a mere 5 miles, this remarkable loop manages to pack in a bit of everything that makes the area’s backcountry great. 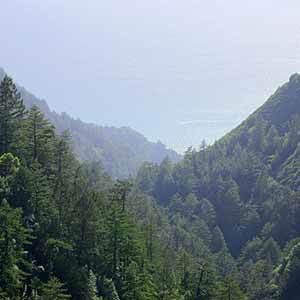 There are lush redwood groves, crystal-clear streams, a challenging climb up a picturesque and forbiddingly steep canyon, and spectacular ocean and mountain views. A quarter-mile stroll on the nearby Waterfall Trail adds a view of a rocky cove and an iconic waterfall. This being Big Sur, the route is definitely more challenging than the average trail, with steep gradients, small amounts of poison oak, and sometimes swarms of bugs. 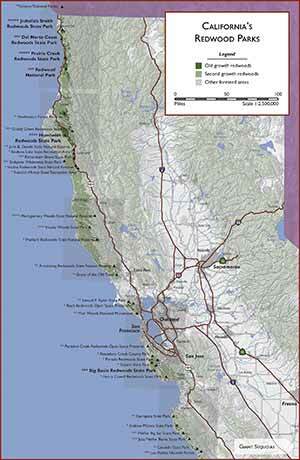 The route is almost entirely wooded and has a surprising amount of redwoods. The trail is well maintained, although you have to keep an eye out for the occasional sprig of poison oak by the side of the trail. Much of the trail can also get very buggy in the springtime, especially near the top. The trail is quite popular. The small parking lot fills up quickly in the summer, but most visitors don’t stay long so with a little patience it’s not too difficult to find a spot. 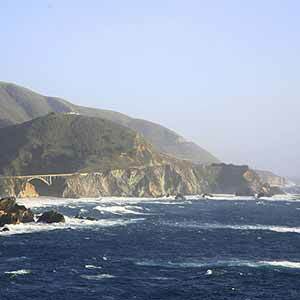 There’s a $10 parking fee unless you park on Highway 1 outside the park entrance. 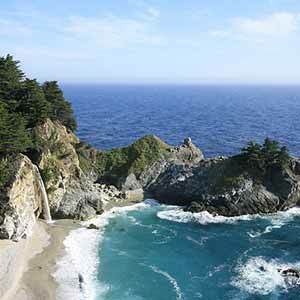 The Ewoldsen Trail starts at the top of the Julia Pfeiffer Burns parking lot. It immediately enters the most impressive redwood grove of the hike. There are a few picnic tables, and a creek flows through the grove. The area near the parking lot gets a lot of foot traffic, so at first the trees are surrounded by dry and dusty bare ground. Soon, though, a surprisingly plush sorrel groundcover appears and the grove becomes even more scenic. After the Canyon Trail spur the trail begins climbing in earnest, rising up the side of the canyon and briefly leaving the redwoods behind. The climb is very steep at first, but then it settles down to a more comfortable grade. The trail meets the creek once again at the loop junction. The loop is somewhat easier in the clockwise direction, so turn left and cross the footbridge. The trail climbs steeply out of the gorge. At one point there’s a sign that says "Steep Cliff / Stay Back". For a few yards after this sign the trail used to be dangerously close to the dropoff, but it now seems a comfortable distance away. The trail itself hasn’t moved; it’s just that the right-hand side of the trail used to be covered with brush dotted with poison oak (see the picture above), and the brush, for the time being, is now gone. There’s a nice view of the coast here, and Highway 1 can be seen eight hundred feet below. The trail turns away from the cliff and passes through a hot, chaparral-covered hillside with dramatic views of the canyon. Across the canyon, redwood groves climb up the steep slopes. 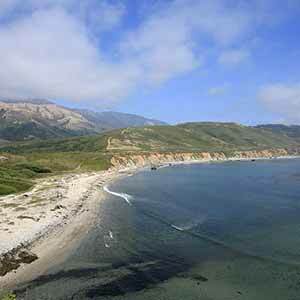 Unusually for the Big Sur coast, there’s no development in sight and no traffic noise. 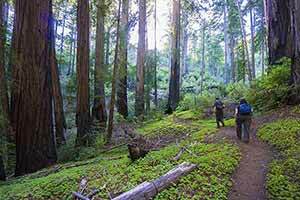 The trail winds uphill through oaks, then enters an upland redwood grove with some surprisingly large, fire-blackened trees. 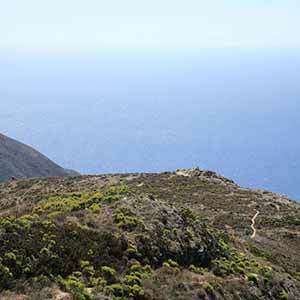 A spur trail climbs to the hike’s highest point, where there’s a fine view of the Big Sur hills cascading into the distance. Birds circle below and, even further below, the ocean shallows show off some striking shades of turquoise. 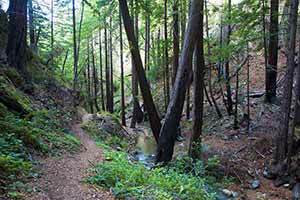 After the spur, the trail descends steeply through oak woodland, then drops precipitously into the gorge. The descent is so steep that it can be difficult to keep your footing. 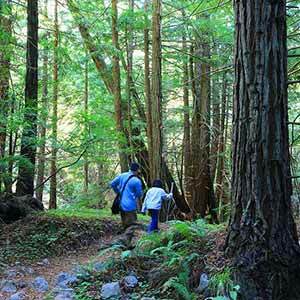 At the bottom of the gorge, the trail enters an exceptional redwood grove. 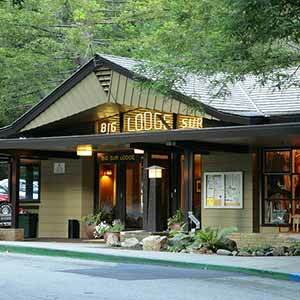 Located in a wide spot in the canyon, the cool shady grove is a welcome respite on hot summer days. Near its beginning, there are two especially large trees off to the left among a dense understory of tanoak. A few steps further and the tanoak gives way to a remarkably plush carpet of sorrel. A clear, fast-flowing stream cascades through the grove. On buggy days there tend to be fewer bugs here, making it a good place to stop. 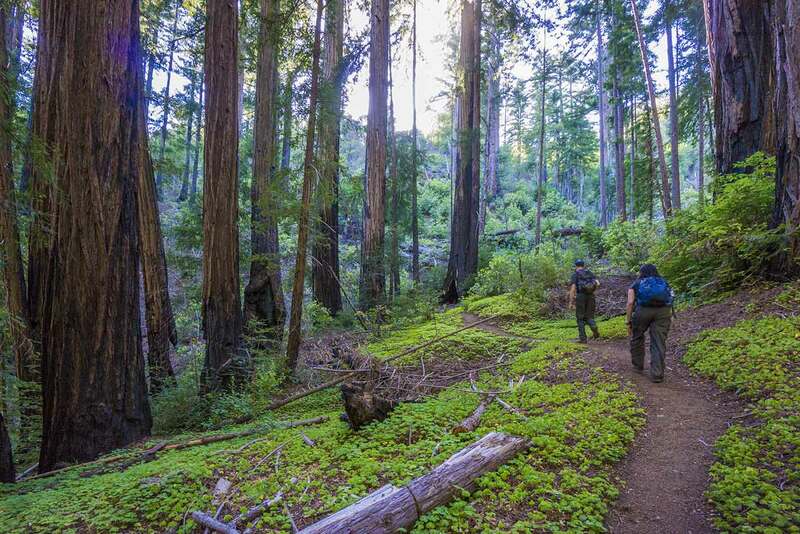 The trail descends steeply through the grove and continues to descend through redwoods as the gorge narrows. For most of the way the trail is cut into the hillside above the creek. Here are a few more photos of the Ewoldsen Trail. 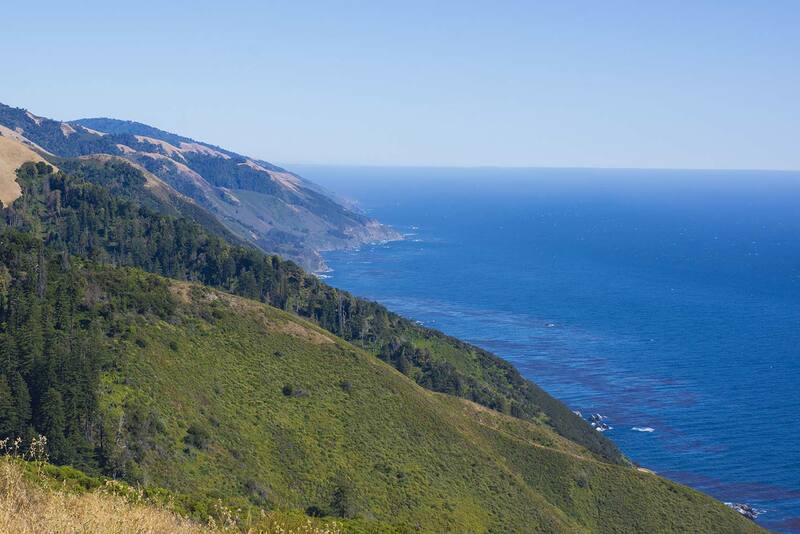 Jon Iverson’s Hiking In Big Sur website has a page on this hike with some very nice photos.